Press a hotkey on your keyboard, such as Shift + Space or the semicolon, to activate Keybreeze. Open files, folders, and websites. Paste custom text into text fields. 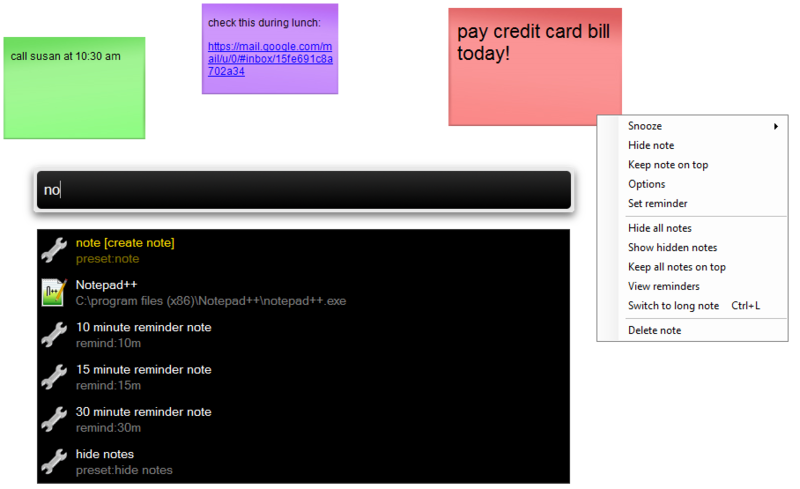 Create sticky notes and set reminders. Control windows on your screen. Automate mouse clicks and keystrokes. Keybreeze runs in the background, staying hidden until you need it. Press a hotkey on your keyboard to display it. Then type whatever you want to do. Version 5.5.3 released December 16, 2017. Runs on Windows 10 and Windows 7. Press the hotkey on your keyboard, type a few letters, and press Enter to paste custom text into a text field. 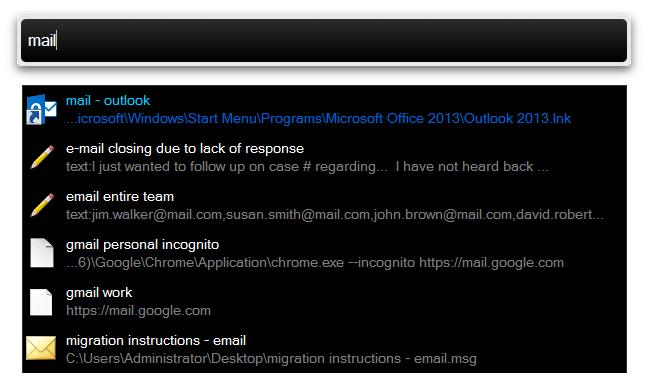 This can include commonly used email responses, step by step instructions, code snippets, etc. Create notes instantly, keep notes on top of other windows, set reminders, snooze a note to have it re-appear a few minutes later, etc. The fastest way to set a reminder. Press the hotkey and type remind as a keyword. Keybreeze will grab the title of the topmost window on your screen. Just enter a time to display the reminder, such as 2w for two weeks, 5h for five hours, or 30m for 30 minutes. Press the hotkey on your keyboard, type a calculation, and press Enter. Add more calculations without taking your fingers off the keyboard. 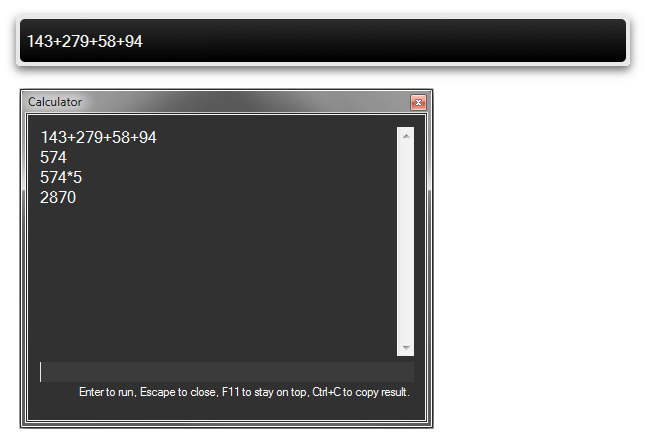 Press CTRL + C to copy the result, or F11 to keep the calculator on top of other windows. Keybreeze helps you do anything on your computer in the fastest possible way. If you want to do something that isn't out of the box, you can automate your mouse clicks and keystrokes with a macro. When you press the hotkey and type the macro, Keybreeze will automatically replay your mouse clicks and keystrokes. Keybreeze includes a free version and a pro version with more features. It's supported on Windows 10 and Windows 7. Download it now, or check out more screenshots or our forum.